Justin and I went to the local independent theater tonight (Yay Pickford!) 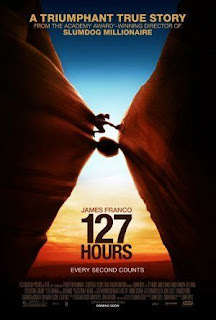 and saw 127 Hours, the Danny Boyle movie that tells the true story of climber Aron Ralston. While hiking in Utah in 2003, Ralson's hand got trapped when a boulder came loose and he was stuck in a canyon, alone, in the desert, for 5 days before he got free. Most of you probably know how he got free. He cut off his own hand and wrist with a knife. Can you imagine the impossible? 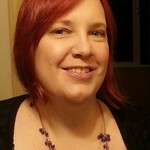 When the movie was over, I turned to Justin and said "I think I probably would have just died." Now, I'm fully aware that I'd never be in the situation that Aron was in. I would never put myself in a situation where I was alone in the middle of nowhere, with no one knowing where I was. But things happen. I can't even imagine it. Most of the movie takes place while Ralston is trapped in the canyon. James Franco did an amazing job portraying him, and all the nuances of what he went through while he was trapped. When he first falls, and the rock pins his hand, the look of disbelief on his face is perfect. I'm sure that looking at that rock, he probably could not believe what had just happened. I'm sure that almost everyone in the theater, if not everyone, knew the inevitable conclusion. You're waiting for it. Ralston realized early on that to escape, he would need to sever his hand. But he didn't want to do it. On the second day, he tests his knife with a sawing motion, and it's not even sharp enough to break his skin. Even when he works up the nerve to stab it into his arm, he hits bone and realizes that there's no way that knife is going to break his bones. The actual amputation scene was graphic, but well done. The worst part for me was before he even started cutting - the breaking of his bones. He basically used the boulder for leverage and bent his arm until the bone snapped. Then he had to do it again to break the second bone. When it came time for Ralston to cut through the nerves in his arm, Boyle used a noise I can't even describe, but that immediately and urgently conveyed the pain and cognitive dissonance of causing that kind of injury to yourself. One of the most incredible things is that he managed to keep himself alive for 5 days. He is an expert climber, and knows his survival stuff. He knew to conserve food and water. He tried everything he could to get out. He knew how to wrap himself to keep warmer when it got cold at night, and how to harness himself so he could sleep. Even more incredible is that after he freed himself, he had to climb out. 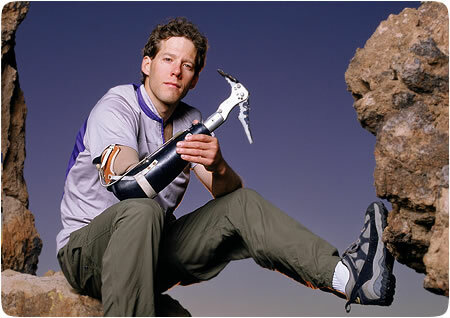 He walked out of the canyon, then rappelled one handed down a 65 foot rock face, then had to walk until he found help. He cut off his arm, then had to HIKE and RAPPEL and HIKE MORE. Ralston had already accepted while he was trapped that he was going to die, and he says it was almost like a rebirth coming out of that canyon. Ralston had already carved his name, birth date, and the date he thought he would die in the canyon wall when he had a vision of his future son, and imagined himself as a father. And he knew that he had to live for that little boy. In February of this year, he became a father to his first son. And what a story he will have to tell that little boy when he gets older. I can't, but this movie brought me a little closer. I'd highly recommend this movie. The actual amputation scene may be too much for some people, but it's not the majority of the movie, and you can always cover your eyes - no shame there. I came away from it with a reminder of the amazing things people are capable of, and the impossible strength of humanity.